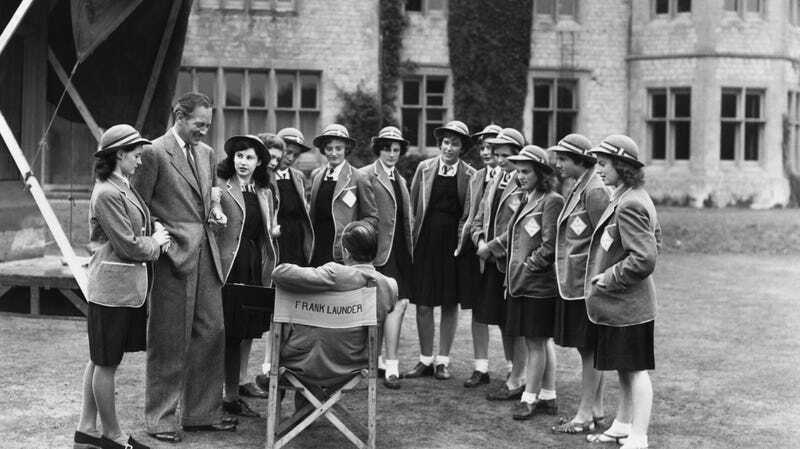 British filmmaker Frank Launder (1906- 1997, seated, centre) with actor Guy Middleton and a group of schoolgirl extras at Langley Court, Liss, Hampshire during filming of the comedy ‘The Happiest Days of Your Life’, 19th September 1949. First #LeggingsGate, now this: a judge in North Carolina has ruled against a charter school’s sexist dress code requiring girls to wear skirts, deeming it unconstitutional. The New York Times reports that the ruling was part of a multi-year effort spearheaded by three girls attending Charter Day School in Leland, North Carolina. The students, ages 5, 10, and 14, launched a petition calling for an end to the school’s uniform policy prohibiting girls from wearing pants, arguing (correctly) that it was unfair for their movement to be restricted when the boys were free to move as they pleased. Burks also noted that when she mistakenly wore shorts on the last day of school one year, she got in trouble. “I had to sit in the office all day and wasn’t allowed to go back to class until my mom could come pick me up—all because I wasn’t wearing a skirt,” she wrote. The ACLU took up the students’ case, and last Thursday, Judge Malcolm J. Howard ruled that the uniform policy was unconstitutional. “The skirts requirement causes the girls to suffer a burden the boys do not, simply because they are female,” he wrote in his ruling. So, the students at Charter Day School are permitted to wear pants no matter their gender, all thanks to three girls who were brave enough to take on an institution of their own accord. Between this story and the one about the high school girls who got the boys in their class to stop making lists ranking their looks, I’m starting to think the kids are going to be alright.